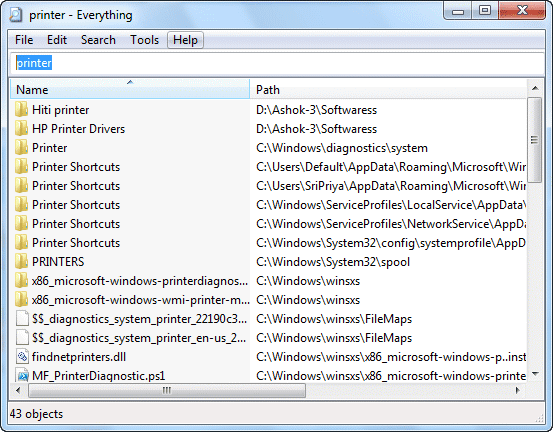 Everything search is a simple & very Fastest searching freeware software. Everyone should download this tool. It is 200% better than the windows search. It scans your hard drive for 15 seconds and indexes all the files list for the first time, and displays every file and folder on your computer. It displays the search results instantly as you start typing. It gives you the experience like you are searching with the speed of the Google. It Searches files with the turbo speed. It has Clean and Simple user interface. It’s file size is very small. It portable and easy to carry with a usb pendrive. It uses very low amout of Ram. For a freshly installed windows pc it uses only 3 to 5 mb of ram. It monitors and updates the newly created or deleted files in real time. Searching files and folders is one problem i have come across in both windows 7 and 8. I was looking for a good third party searching application before i read about “everything search” on your blog. Now i am going to download and use it. Thanks for sharing this useful information.